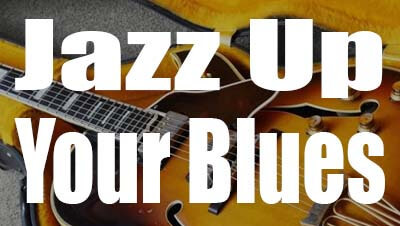 One of the first steps is to look at your typical blues progression and see what changes can be made to “jazz it up”. For the purpose of this lesson we will talk about everything in the key of A Minor but the rules are transposable to different keys. Let’s assuming you’re playing your I IV V in A so that gives you A, D and E. For blues you can stick to those notes as they are commonly seen in blues as 5th or 7th chords, or we can go a little deeper and try some new voicings which would be more commonly found in jazz. You can use these new chords to substitute the existing chords that you use in your 12 bar blues cycle. Notice for the Amin7 we are using our thumb to play the Low E string. This will come us use later on for some of the shifts and free up other fingers to play some of the walking parts. Then you can take that a step further by adding some “walking bass” notes between the chords. The walking notes in this progression are all taken from the A Natural Minor Scale (Otherwise known as the Aeolian Mode). The notes being A, B, C, D, E, F, G and A. We only need the first octave for this. The only note here that isn’t in the scale is the D# (6th fret of the A string) which is the b5 of the Aeolian. 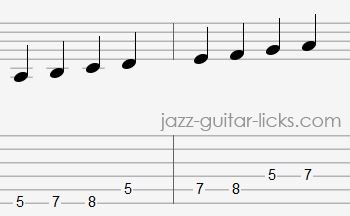 The b5 is often added to the pentatonic scale as the “blues” note so will tie in perfectly with our objective here. In this example, the playing of the chord will cover the first 2 beats of the bar and the walking note will cover the remaining 2. When you want to take it a step further you can split out the chord into a bass note and a chord triad. This will cover 2 beats with each segment of the chord being a quarter note long. The root note will be on the first beat and the chord triad on the second beat. The walking note will be 2 beats long. When combining chords and walking basslines, it takes time to build up your rhythmic awareness and create more complex lines. For this example we are going to take the previous example and add an extra walking note. Where we had the chord split into a bass note and a triad across the first 2 beats and the walking note covering the remaining 2, now we are going to add a second walking note. Both walking notes will cover beats 3 and 4 respectively. 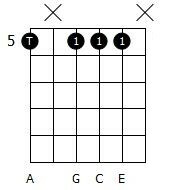 The G# note on the 4th fret of the Low E is outside of the scale but the chromatic run of the G to G# before resolving on the root works well in this context. Now that we’ve built up to playing chords and a walking bass line around a quarter note rhythm it’s time to add some swing. The chord is still split into a root note and a triad, but the timing has now been shifted to a dotted eighth note for the root and a sixteenth note for the triad. We would count this bar as we always count bars of sixteenths (1 e & a) with the root note covering the “1 e &” and the triad hitting on the “a”. As we’ve condensed the chord to fit within one beat we now have three beats left in the bar. This means we can add three walking notes as quarter notes. The additional walking notes added here are all chromatic notes between the existing walking notes from the previous example. The only change is the C note on the Low E string has been relocated to the 3rd fret of the A string for ease of movement on the chromatic run into the D9 chord. Break this one down and run over it slow to ensure the swing locks into the beat. I mentioned earlier that we were taking a blues in the key of A minor and adding a little jazz flavour. This means, if you want to improvise over one of these progressions, the A Minor pentatonic scale, or the A Aeolian Mode, would be the most relevant choice. You’d have your jazzy backing matching up with some bluesy licks from those scales. Given the nature of this piece, we can also call upon the C Major Scale which will work in conjunction with the A Minor Pentatonic. C Major is the relative major of A Minor so you can use both scales at the same time will create some very interesting textures over a jazzy backdrop. If sticking in the key of A Minor, keep a watch out for your b3 notes in the scale (That’s your C notes). You can play a b3 and bend it up half a step to a C# note as it would appear in the C Major scale. Bending between the b3 and the 3 intervals will create an interesting minor to major shift in your lead parts. The rules in this lesson are transposable to any key so try this in different positions across the fretboard and enjoy the results. 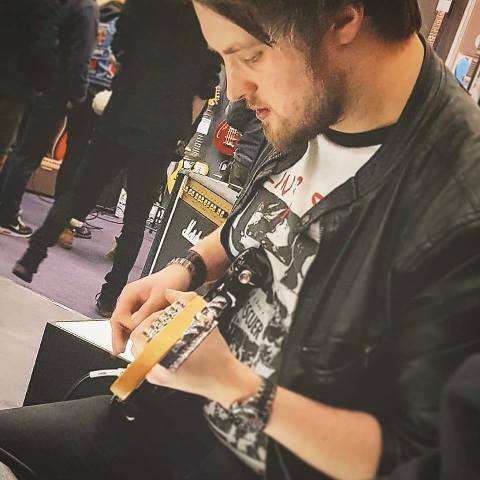 Leigh Fuge is a professional guitarist, tutor and session musician from the UK. He has taught hundreds of guitar lessons to students and enabled them to explore their abilities. He is a blues enthusiast and is always seeking new ways to explore other genres of music via the medium of the blues. When he’s not teaching or writing about guitar, you can find him on the stage or hunting for more vintage gear. 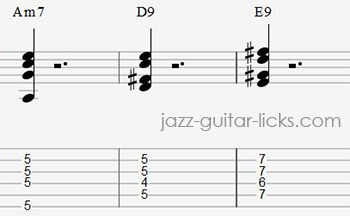 Here is a list of 10 jazz blues tunes that every beginning guitarist should know. You'll find here a guitar transcription with tabs and standard notation of One Note Samba by Antonio Carlos Jobim. This blog article contains a Review and a lick analysis of the album Monk by legendary jazz guitarist Peter Bernstein.